When Rachel discovers letters written by her mother's soul matethe man she thought was her fathershe begins to question everything she's always believed, including soul mates, fate, and even her mother. No longer sure of its power, she decides to quit chasing lightning. Rachel feels abandoned and aloneher best friend has ditched her, her boyfriend has dumped her, and a confrontation with her mom only made things worse. At least she still has her friend Jayin fact, their growing attraction to each other seems to be the only good thing happening. 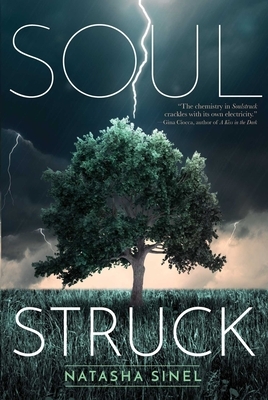 Set in Wellfleet, Cape Cod, in the off-season, Soulstruck is about the search for love and the risk of losing it while waiting for destiny to happen. Natasha Sinel is the author of the young adult novel, The Fix, which received the gold medal for YA Fiction in the 2016 Independent Publisher Book Awards (IPPYs). Her short story, "Moving the Body," appears in the adoption-themed anthology Welcome Home. She graduated from Yale University and University of Michigan's Ross School of Business and was a director of business development at Showtime Networks. Born and raised in Washington, D.C., she now lives in Westchester, New York with her husband and three sons.